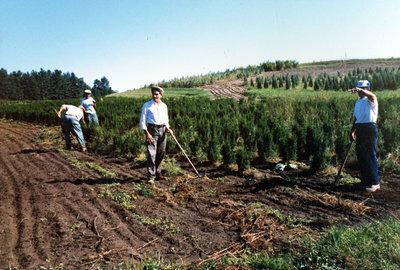 A colour photograph of 4 unidentified people working in the fields at the Whitby Nursery for Weall and Cullen Nurseries Inc. The Nursery was located on Baldwin Street (Highway 12). Cullen Gardens and Miniature Village, Date Unknown, Photographer Unknown. Whitby Archives A2013_042_011.